Troyt “Shot” Loyal Banks, Jr., 80 year old resident of Leedey, OK, passed from this life on April 8, 2016. Shot was born October 5, 1935 to Troyt Sr. and Edna (Barnard) Banks in Leedey. Shot grew up in Leedey and attended Leedey Public Schools where he graduated with the class of 1953. On October 1, 1955, Shot married Betty Jo Mc- Millan at the First Baptist Church in Harrah, OK and to this union three children were born Micheal, Tammy, and Mark. Shot and his family lived in Oklahoma City, Midwest City, Yukon before moving back to Leedey in 1973 were he resided the remainder of his life.Shot worked for OG&E, Panhandle Eastern Pipe Line, as a hotshot truck driver, and was a farmer and rancher. 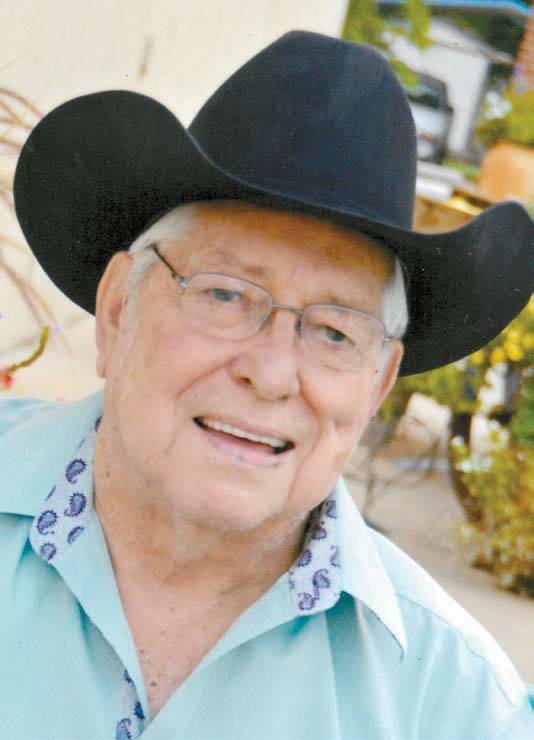 Shot loved horses, team roping, traveling, but most of all he enjoyed spending time with his grandkids, and great grandkids. Shot was a member of the Yukon Jaycees organization and a member of the Leedey United Methodist Church where he participated in the Leedey Methodist Board and Methodist Church Conference. Shot was loved by his family and friends and will be dearly missed. Shot is preceded in death by his parents Troyt and Edna Banks and his brother Lynn Banks. He is survived by his wife Betty Banks; sons Micheal Banks and wife Lucy of Cheyenne, OK, and Mark Banks of Hammon, OK; daughter Tammy Miller and husband Bobby of Cushing, OK; sister Leah Smith and husband Joe of Leedey, OK; grandsons Chantry Banks, Daniel Hughes and wife Chelsea and children, Josh Barfield and wife Nicky and children, Rusty Moler; granddaughters Trista Cole and husband Adam and children, April Thompson and husband Joey and children, Nicole Janning and husband Patrick and sons, Deon Garrett and husband Nick and children, Latisha Barfield and daughters; twenty-five great grandchildren; and many nieces, nephews, and friends.